Here is my last Halloween project. 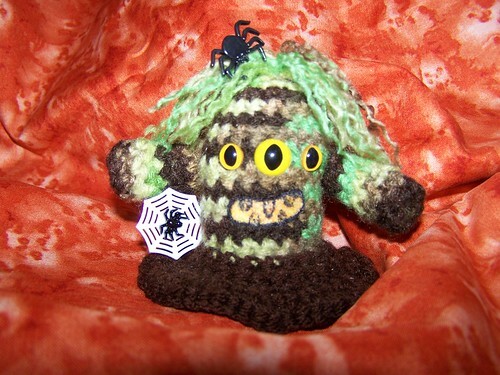 This is my little monster made from a pattern I purchased from Emily Millers Emporium on Etsy. It was actually for a ghost but she suggested getting creative and making a monster from the same basic shape. So I did. Didn’t get time to make a ghost. I have started on some things for Christmas(not all crochet) but nothing ready to post here. Was bound and determined to finish what little I was doing for Halloween before jumping into Christmas. Now I can go for it! Great green hair! I love Halloween decorations.